HTC Shift for $200 – Take a piece of Design History! The HTC Shift. 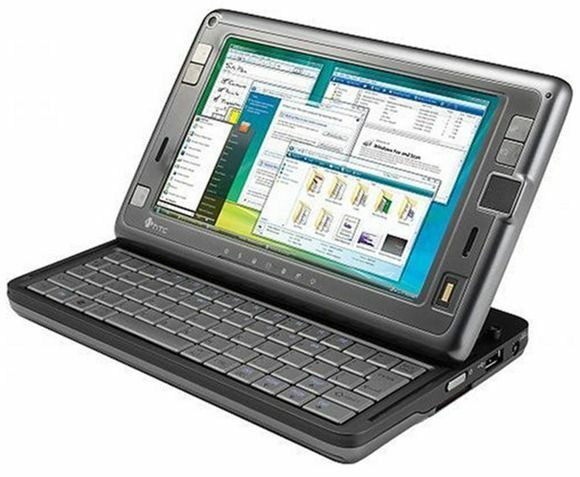 A fantastic design that failed due to overly heavy operating system, a short battery life, low screen resolution and limited Windows Mobile implementation. Over a year of rumors and false-starts the HTC Shift became the most viewed device on UMPCPortal by a long shot. Videos of it were always popular and even after it launched, communities grew quickly and great things were done with the device. The short battery life and high cost killed it in the end through and as smartphones took off and even due to Intel moving towards the MID, it lost ground quickly. Still, it’s an amazing bit of engineering and there might even be a few use case left for it. Certainly a 30 minute session in the coffee shop could be worth a lot of fun and a few discussions! At $199 it’s worth a but of fun and maybe worth trying some Ubuntu, ChromeOS or other lightweight OS. Unfortunately this isn’t the 3G version. Anyone up for it? Or maybe you’re waiting for the updated version?! Hehe, i think i’ll rather get that Asus slider instead. Or perhaps look into getting a Cupp module installed into that ultrabook slider you were buzzing about the other day. well, throw in one of these portable external powerpacks (almost the same size as the device itself) for 30 -40$ and you will get 10+ hrs on the go. then kick vista for win 7 (should’t be a problem using the existing vista drivers). Sorry Yu. We had someone hack our server and bypass wordpress spam protection. Everything should be back to normal now. I just install windows 8 on mine, its a amazing machine now! Buy it! where can we buy one of these?